Hot Dog Entrepreneurs celebrating six years as "Top Dogs"
It wasn't their grand plan to end up in the restaurant business. According to Paul Tripi he was gong to be a lawyer and and his brother Frank would be the banker, at least that's what they went to school for. As it turned out in 2013 the brothers bought a food truck and went into business as Frank Gourmet Hot Dogs. Not content to just sell hot dogs they decided to create a better hot dog. Paul says "we wanted to work with farmers, and offer a better product, using grass fed pork and beef, no nitrates and no preservatives." The booming food truck business blossomed into a bricks and mortar eatery on Kenmore Avenue which they opened last June. The menu includes their popular hot dogs, fresh ground hamburgers, hand cut french fries and they are starting to make their own pastrami. According to Paul "everything we do from start to finish we do in house." Frank Gourmet Hot Dogs is celebrating it's sixth anniversary. They are located at 707 Kenmore Avenue, Buffalo, NY 14223 phone 716.322.5933 you can get moreinformation at their website. KENMORE, N.Y. (WKBW-TV) — It wasn't their grand plan to end up in the restaurant business. According to Paul Tripi he was gong to be a lawyer and his brother Frank would be the banker, at least that's what they went to school for. 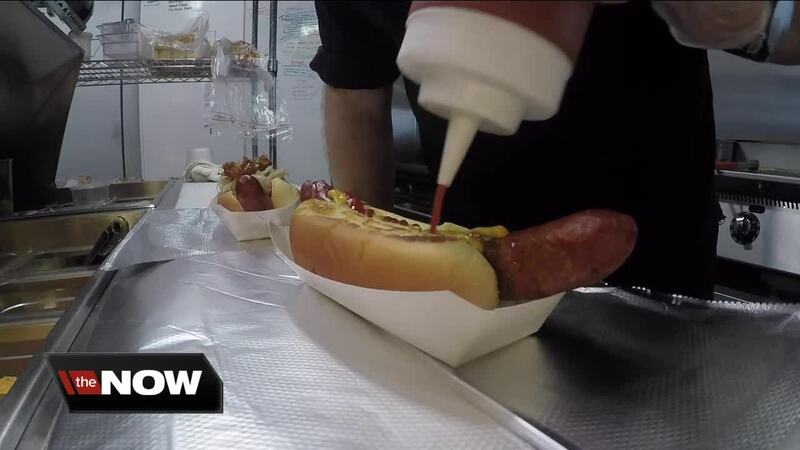 In 2013 the brothers bought a food truck and went into business as Frank Gourmet Hot Dogs. Not content to just sell hot dogs they decided to create a better hot dog. Paul says "we wanted to work with farmers, and offer a better product, using grass fed pork and beef, no nitrates and no preservatives." The booming food truck business blossomed into a bricks and mortar eatery on Kenmore Avenue which they opened last June. The menu includes their popular hot dogs, fresh ground hamburgers, hand cut french fries and they are making in house pastrami. According to Paul "everything we do from start to finish we do in house." Frank Gourmet Hot Dogs is celebrating it's sixth anniversary. They are located at 707 Kenmore Avenue, Buffalo, NY 14223 phone 716.322.5933 you can get more information at their website.